Black Lives Matter activists shot in Minneapolis. What next? Will investigators release the video of Jamar Clark’s death now? 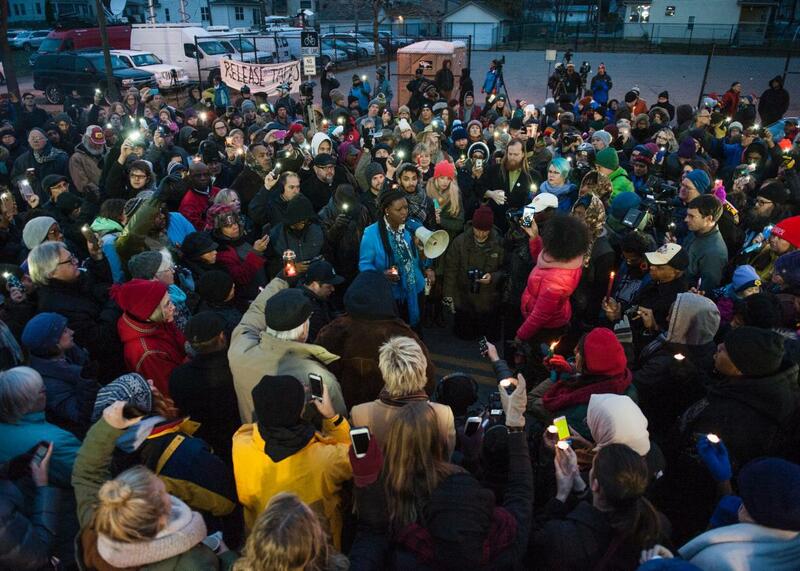 Nekima Levy-Pounds, Minneapolis NAACP president (with megaphone), speaks at a candlelight vigil held for Jamar Clark outside the 4th Precinct police station on Nov. 20, 2015, in Minneapolis. Police in Minneapolis were looking for three white male suspects Tuesday morning after gunmen opened fire and injured five people at a Black Lives Matter protest around 10:45 p.m. on Monday night, reported the Star Tribune. None of the victims suffered life-threatening injuries, though one was reportedly shot in the stomach and needed surgery. A witness, Oluchi Omeoga, told the Associated Press that prior to the shooting, she saw three people in masks “who weren’t supposed to be there.” Those three individuals were being escorted from the rally by demonstrators, a Black Lives Matter organizer told the New York Times, when they pulled out their weapons and started shooting. According to the Times, witnesses on social media reported that the gunmen, who fled the scene, were wearing bulletproof vests. The protests where the shooting took place have been going on for more than a week, with demonstrators pitching tents about a block from Minneapolis’s 4th Precinct police station to call for answers in the death of 24-year-old Jamar Clark, a black man who was shot in the head by a police officer following an altercation on Nov. 15. Witnesses to that incident said Clark was in handcuffs when he was shot, which the police have disputed. According to the AP, investigators from the state Bureau of Criminal Apprehension are reviewing video footage taken from the ambulance, a mobile police camera, and other sources, but they’ve said none of it shows what happened in its entirety. Demands for the video footage to be released publicly have been the driving force behind protests since Clark’s death, presumably because video footage has played such a pivotal role in garnering attention to previous police shootings—including that of Laquan McDonald in Chicago, whose killer is expected to be charged with first-degree murder Tuesday. According to the AP, the family of Jamar Clark issued a statement through the office of Congressman Keith Ellison asking that demonstrators to end “the occupation of the 4th precinct” and move on to “the next step” in light of the safety concerns raised by Monday night’s shooting. The Wall Street Journal reports that, prior to the shooting, Black Lives Matter had planned to announce “next steps” that the group had prepared during a weekend strategy meeting with community organizers. Update, 2:03 p.m.: Two suspects have reportedly been arrested in connection with a shooting Monday night in Minneapolis that left five Black Lives Matter protesters injured. One of the two suspects now in custody is a 23-year-old white male. Update, 5:10 p.m.: The second suspect arrested Tuesday afternoon has been identified as a 32-year-old Hispanic man. The police investigation looking into other possible suspects continues.